Queenstown, New Zealand, sits on the banks of Lake Wakatipu and is surrounded by mountains, making this spot a premier vacation destination for outdoor enthusiasts. This lake and alpine resort offers an array of adventures, whether you want to head out on the water, hit the slopes, or simply take in the natural beauty of the area. So, line up your Apollo campervan hire, and head to Queenstown for an unforgettable vacation. Check out these top attractions while you’re there. The Skyline Gondola takes you above Bobs Peak, giving you spectacular views of Queenstown. You’ll take in a 220-degree panorama on your ride, and once you reach the observation decks, you’ll be able to spot Coronet Peak, The Remarkables mountain range, and the expansive Lake Wakatipu. 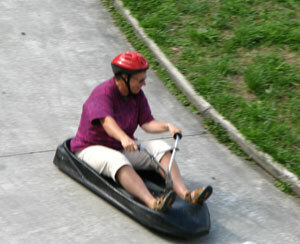 Add a little bit of adventure to your Skyline tour by hopping aboard the Luge, a non-motorised cart that takes you 800 metres downhill. Take a helicopter tour of Doubtful Sound, where you can spot the second-largest fjord in Fiordland National Park. If you look closely, you’ll also spot bottle-nosed dolphins, seals, and penguins. Your helicopter tour will include a picnic lunch on the West Coast beach. Glenorchy is about 45 minutes from Queenstown, and it serves as the entrance to Mount Aspiring National Park. Here, you can explore some of New Zealand’s best hiking trails or hop on a horse for a ride through the scenic terrain. You’ll have access to both Lake Wakatipu and the Dart River, where you can kayak or jet ski. If you’re looking for outdoor adventure, head to Glenorchy, where you’ll also be able to tour the spot where scenes from The Lord of the Rings was filmed. Thanks to its easy access to Lake Wakatipu, Queenstown offers many boat tours, giving you an up-close look at the area’s natural beauty. Hop aboard the Spirit of Queenstown, which will take you across Lake Wakatipu to the more remote Mount Nichols High Country Farm. Here, you can enjoy a guided tour of the area and capture panoramic views of the stunning landscape. 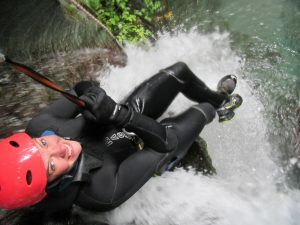 If adventure is more your style, go canyoning in Queenstown, they have some amazing women guides. Get that adrenaline pumping and descend through rivers and streams throughout Queenstown. You can slide down waterfalls, dive into pools, and even zip line over some of Queenstown’s waterways. Within a 90-minute drive of Queenstown’s city centre, you can discover an expansive wine country that boasts more than 200 vineyards. The Central Otago Wine country includes six regions that produce highly acclaimed wine, 80 percent of which is Pinot Noir. In fact, this area is the southernmost wine country in the world, and its favourable soil and climate help to create long-lasting, popular wines. Gibbston is the closest region to Queenstown, just a 20-minute drive, allowing you to sample some of these wines, tour vineyards, and enjoy food pairings at several wineries. A campervan journey to Queenstown offers a fun-filled vacation that truly delivers something for everyone. 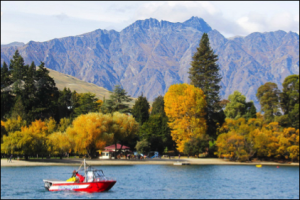 Whether you want to stroll through the city centre and take in the scenery, go on a relaxing boat ride, get that adrenaline pumping during an outdoor adventure, ride around the city in your Apollo campervan or sip on some famous New Zealand wine, you’ll enjoy an unforgettable trip to Queenstown.